While we’re not generally fans of those national food holidays (National Welsh Rarebit Day? National Cream-Filled Chocolate Day? Hard pass, thanks very much), we’ll accept today, January 11, as National Hot Toddy Day. It’s winter; it’s Monday; and we should all get toddied more often. The secret of hot toddies is that they’re actually way easier than other cocktails—all you need is a kettle. Since you’re using hot water, you don’t need to make any kind of fancy syrup; your sweeteners will dissolve into the drink with just a quick stir. The steam also carries all the aromatics right up to your happy nose, meaning any ingredient you drop in a toddy will immediately come through in the aroma. Put a cinnamon stick in a cold drink and it won’t do much (at least not right away). In a toddy? Much different story. Here are three of our favorite toddies this season, as simple and satisfying as a cocktail could possibly be. 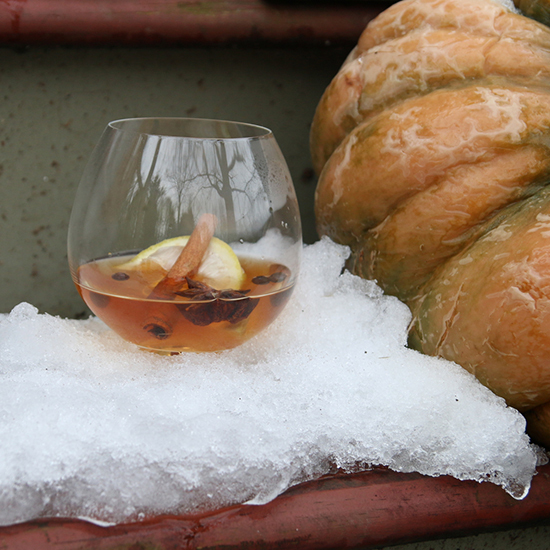 Bourbon and brandy are both classic toddy bases, but we’re going with a different sort of brandy today: applejack. Distilled from apples and then barrel-aged, it’s got the heft of any other brown spirit but, in toddy form, ends up reminding us of hot apple cider. Except in this case, very hard apple cider. Instructions: Add 2 ounces of applejack (Laird’s Bottled in Bond is your best choice here) and 1 teaspoon of maple syrup to a heat-safe glass. Add a dash of Angostura bitters. Heat 2 ounces of water to a near-boil and pour into glass; stir until maple syrup is dissolved. Insert a few cloves into a lemon wedge, squeeze it in and leave in the glass. Garnish with a long cinnamon stick and a thin slice of apple. Bourbon toddies tend to be delicious, but they’re safe. Looking for something a little funkier? Go for a full-throttle, crazy-smoky-peaty Scotch like Laphroaig. For a spirit this intense, we’re going with robust garnishes like grapefruit and pink peppercorn. This one isn’t for Scotch novices, but if you’re all about flavor, you’ll adore this. Instructions: Add 1 1/2 ounces of Laphroaig 10 (or another Islay Scotch) and 1 teaspoon of honey to a heat-safe glass. Heat 3 ounces of water to a near-boil and pour into glass; stir until honey is dissolved. Stud a grapefruit wedge with a few cloves, squeeze it in and leave in the glass. Add a few pink peppercorns. Wait—Campari? That bitter Italian stuff? Amazingly, it makes a beautiful toddy; its bittersweet herbal notes emerge with hot water, and honey brings it from superbitter to pleasantly so. Instructions: Add 1 1/2 ounces of Campari and 1 teaspoon of honey to a heat-safe glass. Heat 3 ounces of water to a near-boil and pour into glass; stir until honey is dissolved. Take a lemon wedge, squeeze it over the top and toss it in.